A groundbreaking plan to prevent and reverse Alzheimers Disease that fundamentally changes how we understand cognitive decline. In this paradigm shifting book, Dale Bredesen, MD, offers real hope to anyone looking to prevent and even reverse Alzheimer's Disease and cognitive decline. Revealing that AD is not one condition, as it is currently treated, but three, The End of Alzheimers outlines 36 metabolic factors (micronutrients, hormone levels, sleep) that can trigger "downsizing" in the brain. The protocol shows us how to rebalance these factors using lifestyle modifications like taking B12, eliminating gluten, or improving oral hygiene. The results are impressive. Of the first ten patients on the protocol, nine displayed significant improvement with 3-6 months; since then the protocol has yielded similar results with hundreds more. Now, The End of Alzheimers brings new hope to a broad audience of patients, caregivers, physicians, and treatment centers with a fascinating look inside the science and a complete step-by-step plan that fundamentally changes how we treat and even think about AD. Dale Bredesen, M.D., is internationally recognized as an expert in the mechanisms of neurodegenerative diseases such as Alzheimers disease. He graduated from Caltech, then earned his M.D. from Duke University Medical Center in Durham, North Carolina. He served as chief resident in neurology at the University of California, San Francisco (UCSF) before joining Nobel laureate Stanley Prusiners laboratory at UCSF as an NIH postdoctoral fellow. He held faculty positions at UCSF, UCLA, and the University of California, San Diego. Dr. Bredesen directed the Program on Aging at the Burnham Institute before coming to the Buck Institute in 1998 as its founding president and CEO. He is the chief medical officer of MPI Cognition. "Alzheimers is a disease for which there is no cure. Dr. Bredesens experimental program gives me hope that there are actions we can all take to care for our brains and keep Alzheimers at bay." "The End of Alzheimers is a monumental work. Dr. Bredesen completely recontextualizes this devastating condition away from a mysterious and unsolvable process to one that is both preventable and, yes, reversible. Pinning our hopes on pharmaceutical research to develop a miraculous wonder drug has left both physicians and patients empty handed. But now, this comprehensive approach offers solid results, bringing hope to so many." 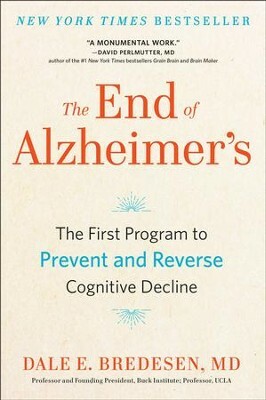 "This book represents a major turning point in our approach to Alzheimers disease, from viewing it as a mysterious and incurable affliction that is governed almost exclusively by our genes, to understanding it as a multifactorial condition that can be prevented and even reversed largely through nutrition and lifestyle change. For the first time ever, patients and families affected by Alzheimersas well as those at high risk for this devastating diseasetruly have a reason to be hopeful." "The End of Alzheimers is a masterful, authoritative, and ultimately hopeful patient guide to functional medicine for your brain. It will help you prevent and reverse Alzheimers disease, whether you have the ApoE4 gene or not. My patients fear Alzheimers more than any other diagnosis. This is the book to transmute fear into action." "The End of Alzheimer's offers a new beginning in Medicine  changing the focus from a singular disease to recognizing the systems-based approach required to care for the whole person. Dr. Bredesen translates the knowledge of science to the wisdom that helps to heal our people . . . and provide a vision for the end of Alzheimers!" I'm the author/artist and I want to review The End of Alzheimer's: The First Program to Prevent and Reverse Cognitive Decline.